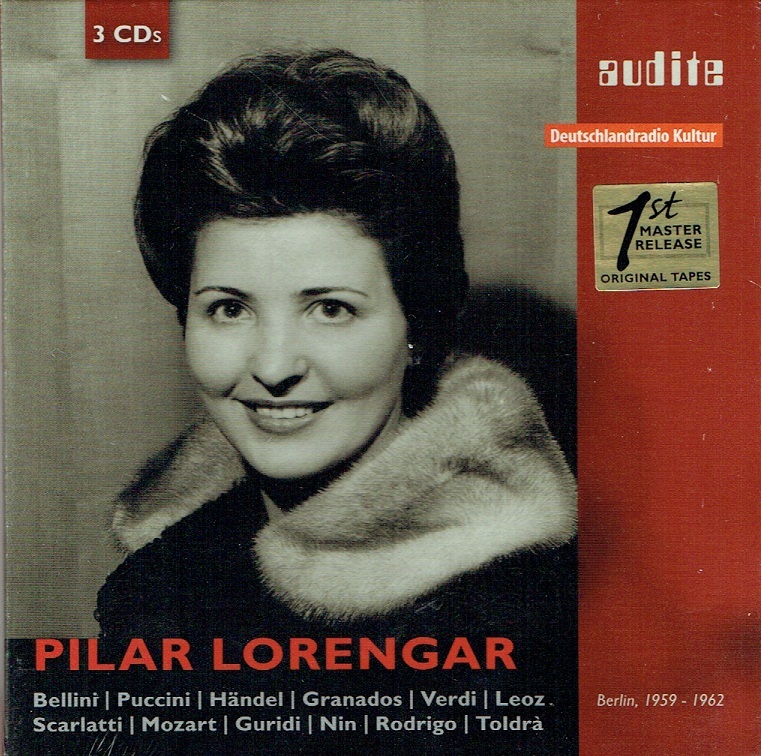 "Pilar Lorengar [1928-1996], the Spanish singer whose adopted home city was Berlin, especially owed her worldwide but unobtrusive fame to the operatic stage. She had one of the most beautiful voices heard in the post-war years: creamy-toned and perfectly placed, her voice remained firm and youthful in timbre for more than 30 years. She was famous for a repertoire ranging from the youthful heroines of Mozart, the youthful dramatic heroines of Verdi and Puccini to tragic girlish figures such as Tchaikovsky‘s Tatiana and Janácek‘s Jenufa. 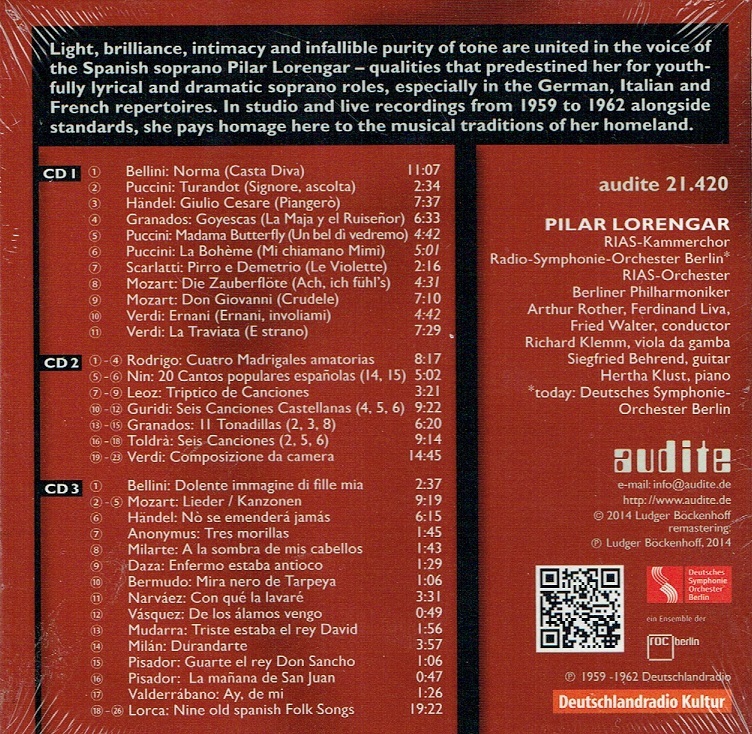 These three CDs of arias and Lieder contain sound documents from the singer‘s early Berlin years, in studio and live recordings made between 1959 and 1962. 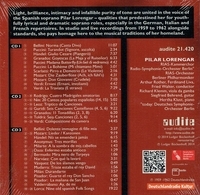 Audite presents Lorengar from unusual perspectives, both in the field of opera and in Lieder. She is not heard here in her established Mozart role of Donna Elvira, but as Donna Anna. In addition, she can be heard singing repertoire that was unusual for her: the prayer 'Casta Diva' from Bellini‘s NORMA, 'Piangerò la sorte mia' from Handel‘s GIULIO CESARE and a Handel cantata; an aria from a Scarlatti opera; Elvira's aria 'Ernani, involami' from the eponymous early Verdi opera and the role of Rosario from the opera GOYESCAS by Granados. This Mozart singer also reveals herself here to be an agreeable Lied singer. The remaining two thirds of this anthology pays homage to the musical traditions of her homeland. As a young schoolgirl in Madrid, she acquired extensive experience in the music cafes and the zarzuela theatre. In the present release, she unfolds a panorama of Spanish music history extending over five centuries, ranging from the vocal art of the 16th- century vihuelistas to the folklore collections and adaptations of Federico García Lorca."